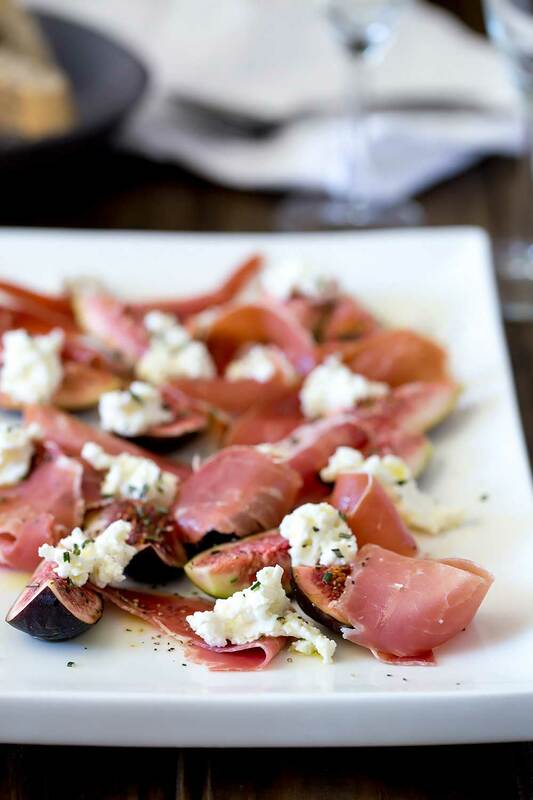 Sweet, warm figs, with salty prosciutto, creamy ricotta and a pop of rosemary and extra virgin olive oil. This salad is utterly delicious and utterly gorgeous! Tasty and beautiful! That is what we all need in our lives. Life isn’t easy is it?! Just when you think you have got it all together, a curve ball is hurled your way and you have to get it together all over again! I am having one of those weeks! After several failed attempts at writing a post for my beautiful Spanish Chicken Recipe (which I will get up soon!!! ), I knew my mind was elsewhere so there was nothing for it but to call a friend up, have a glass of champagne and pour my heart out! And so I did! 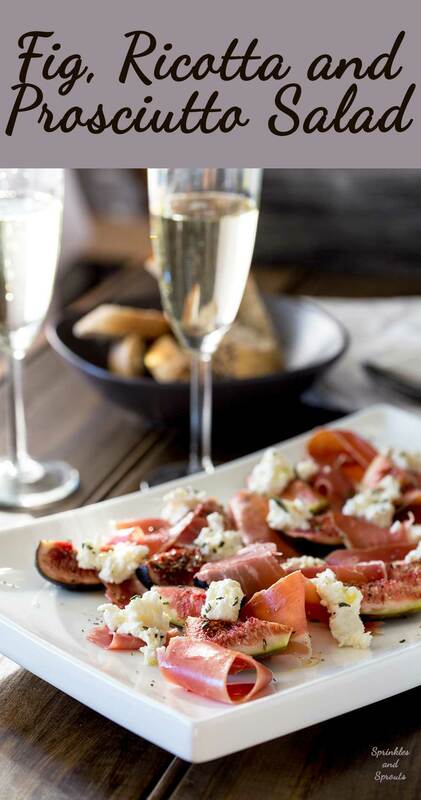 Over food and a glass of bubbly, we righted the world. Well sort of! We berated the world quite a lot 😉 but we felt better once it was over. Friendship, food and wine are the cures to so many of life’s woes! Or at least the things that get you through life woes! This salad is perfect for those kind of meals. It is simple, delicious and light enough to leave room for several chocolate brownie squares (because brownies makes things better too!!!!) but substantial enough to soak up the glass or two of bubbly! That is why there are very few photos of this salad. A glass of bubbly, a good friend and suddenly you have eaten most of the food and only have 4 photos! Oops! A few quick notes on the salad. When you dress the dish at the end, you want a really grassy extra virgin olive oil (am I cool enough to use EVOO?????) 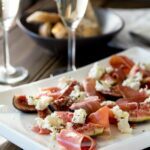 it really works with the sweetness of the figs and the salty prosciutto. 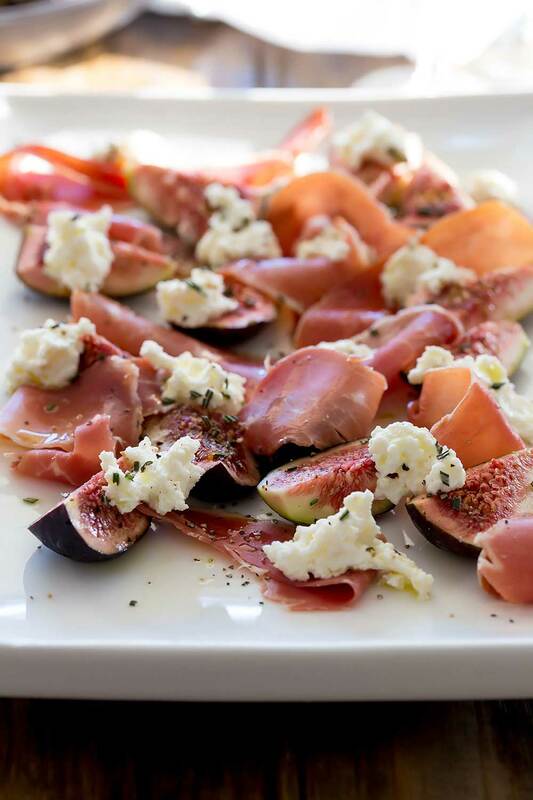 If you love this recipe for Fig, Ricotta and Prosciutto Salad why not pin it for later. Cut the figs into quarters and lay cut sides up on a baking tray lined with cooking paper. 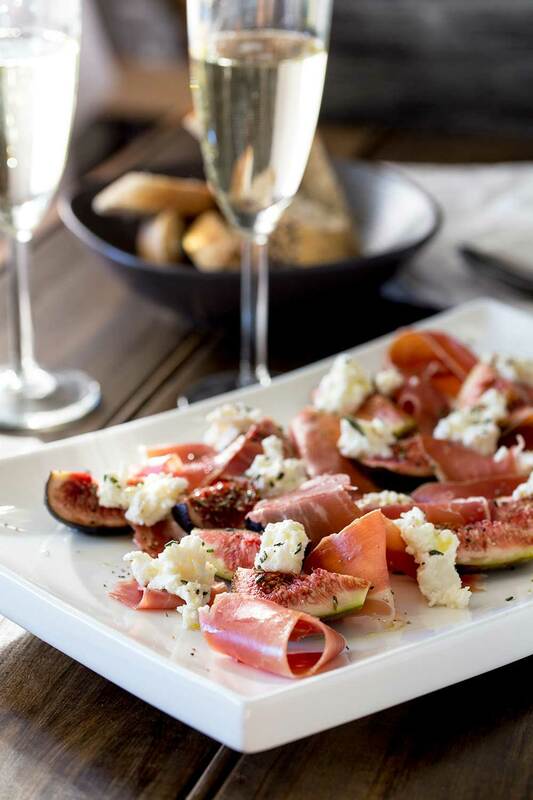 Once the figs are warm, arrange them on a platter, rip your prosciutto into long slivers and twist and twirl it over the platter. Dot with the fresh ricotta. Finely chop the fresh rosemary leaves. Sprinkle this over your platter, drizzle with the extra virgin olive oil and give it a good grinding of salt and black pepper. If you want a much softer fig you can cook the figs for 10-15 minutes. This is one of the most wonderful combinations of ingredients. 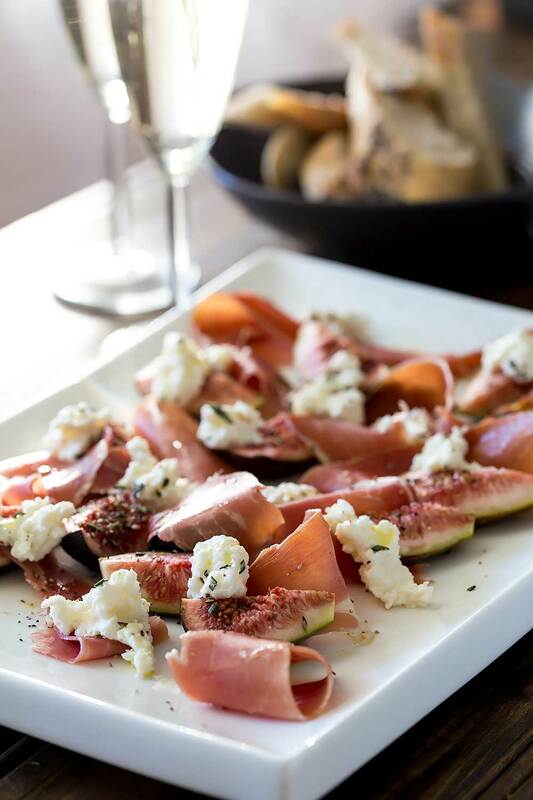 Figs, prosciutto and some kind of cheese. I agree with you – this needs to be in all of our lives! I have a fig tree too Dorothy 🙂 It was badly burnt in the fire, but it fought back and this year it did some fruit. We are coming to the end of the season here in Australia. Oh wow!!!! I bet that was amazing!!!! I am still hoping to meet up with Nagi in Sydney…one day! We always make this as a starter when we are having Italian night. It always goes down well. It is such a wonderful way to start a meal, or as a lunch with bread. Have a go at the ricotta it is so simple and tastes delicious. This is my first time visiting your blog, and holy moses, lady, your pictures are gorgeous! This salad sounds so amazing and I can’t wait for figs to come into season here so I can try it! We are getting towards the end of fig season here in Australia. My fig tree is starting to look a little sad. Hope you enjoy it!